The fiat money quantity is comprised of fiat money both in circulation and available for circulation, being parked at the central bank in the form of the reserves of depository institutions. 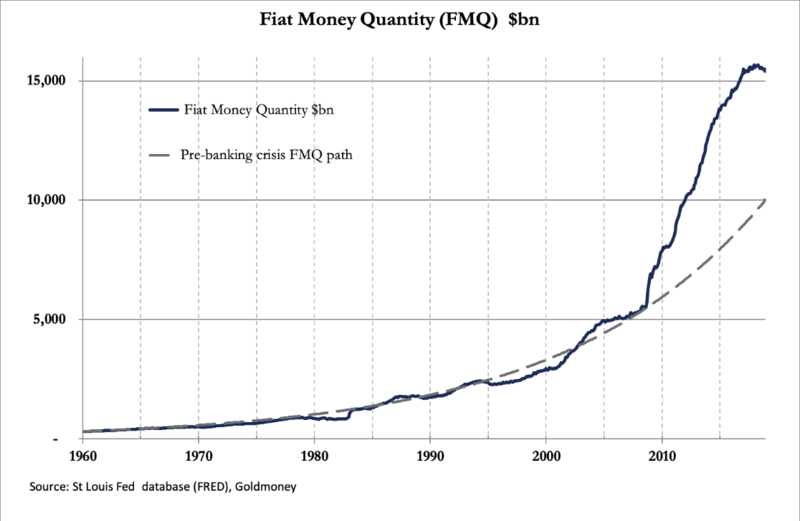 The expansion of US$ FMQ since 1960 is shown in the chart below. Before the great financial crisis of 2008/09, FMQ expanded reasonably consistently at an average annual rate of 5.9%, shown by the pecked line. Excess reserves were virtually non-existent and required reserves were at little more than $10bn. Following the Lehman crisis, quantitative easing led to the accumulation of excess reserves as depository institutions sold bonds to the Fed and had their reserve accounts credited with the proceeds. Consequently, FMQ increased at a significantly faster pace than its long-term trend, leaving it $5,386bn above the pre-Lehman crisis trend at the end of last year.